So I dunno if you've noticed it too but I've been suspecting a pattern to the recent 'We Plug G.O.O.D Music' features and I spotted it while I was puttin together this latest blog... All of the music we showcase on each of our features literally span the globe... from the U.S 2 Africa and back to the U.K! While it's certainly not been intentional, it does go to show the GLOBAL appeal & reach of the 'We Plug G.O.O.D Music' movement! ... And like we always do it, let's get stuck right into the G.O.O.D.M.U.S.I.C!!! Well 'that brova anyway' was/is Soundbwoy Entertainment's 18year-old singer/song-writer from North London, Young Nate and he burst on the scene properly with this 'UKG sounding' stellar effort that had production oozing with the Soundbwoy signature... Lets listen! U-U-U-UKKKKK!!! What you jus heard is called 'I Wonder' (The colossal Wretch 32 graces the REMIX & its so heeaavvyyy yo!!!) and its official release date is May 11th and its the second single (at the back of 'Mixed Messages') of the forthcoming debut E.P, 'A Piece of Me' which is to be released this summer and after he KILLED IT at a rammed out O2 arena as the opening act for Bad Boy Record's Day 26 & Donnie Klang back in February, this kid is definitely the FUTURE! DO you Like? Tell me... Tell me... Tell me!!! So straight from an 18year-old British singing sensation that's about 2 BLOW, we're gonna take you over 2 Africa where another 18year-old (see what I did there lol) emcee is sounding like he's ready to get his 'shine' on all over the hip-hop circuits. He showed up @ last year's Nigezie Tru Search in Nigeria & WON in the North-Central region of the competition... & in ways that only we can, we've got a couple exclusive records! Ladies & Gentlemen, I Plug 2 Y.O.U... Skales! NOW I cannot get this tune outta my head... I been goin 'headin 4 a grammy, one man army' over & over for a whole week lol! Part of it, I think, has to do with the production on the record! the thumping beats are that G.O.O.D head bumping kind that we love and what did I tell you about the flow? Dude can switch up his style to go all energetic on a ridiculous beat like this and still go all gentle when he needs to, like on 'Feel The Music'. & did you notice the backing vocals on the second verse? I thought that was brilliant, it adds that haunting feel to the song. It sounds very much like a fight song and I suppose that moniker fits right in as Skales tells us he's literally gonna go tooth & nail to bring that Grammy back home... We wish him all the best & we'll be sure not to stand in his way! BUT this is where I have qualms with his management team.... For a brova who's heading for a grammy? NO myspace? NO website? No reach? NO presence? Come on guys, what are you playing at? ANyway ladies & gentlemen, what do we think of Skales??? Soo if the pattern we suspect is true, we'll have one more artiste 2 feature and they'll be from the states, if the pattern exists though??? 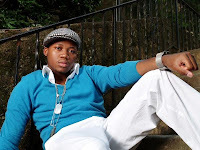 Cue in 23year-old Nigerian Born, ATL based R&B reco rding artiste (honest to God, its all a coincidence), Keno Kenett or jus Keno for short (lol)... Describing his style as inspired by Blues, Jazz & Afro-Beat with influences to include Etta James, Donna Hathaway, Nina Simone & Fela Anikulapo-Kuti, what you get from this 8 year veteran is NO games... No gimmicks... just his voice in its true form and that's where he says the music lies. You would be permitted to expect ALOT from this airy falsetto singing ladies man, cos I know I do! We got first dibbs on a couple records from his upcoming album (we think its gonna be called Love Drunk but we're NOT sure) & your opinions are very much needed and appreciated... First off is what might be the first single of the L.P, its called 'Selfish 24/7'. Wow!!! He says he's got enough soul for an eternity & after hearing that, how can we doubt the kid... I know I'm always harboring on about how 'musical' certain records are & I hope you get what I'm on about BUT you can't fault this record, the production is so on point giving it that summer-in-your-'top-down'-riding-slow feel to it... the gentle lyrics & the dude's voice jus add to the GOOD MUSIC that is 'Selfish 24/7', although the talking at the end there could have been avoided in my opinion. And to ride this listening party to the end, Keno laced us with an uncompleted version of another top tune from the album, it's called 'Never Gonna Stop' and the completed version is supposed to have a female emcee somewhere in there and the beats jus need to be tweaked a lil more but its sounding quite CRISP already... Aww where are my manners? Listen and let's continue this conversation in about 4minutes! Like I was saying ladies & gentlemen... Real G.O.O.D Music right here or what do you reckon??? Your feedback is especially welcomed by Mr. Kenett himself and you know I always love the conversations! And that's it folks from 'We Plug G.O.O.D Music' at the moment... all of your feedback and comments are much appreciated, please keep em coming! So as per usual... tell us who & what you're feeling? Who & what you're NOT feeling?... Keep it a 100 like always! OMG Nate is such a babe! And at that concert when he was singing to that girl from DK! OMG!!! And emm, only America is facing a creative recession... UK talent defo on the rise! @ Dav!D... lmao! I wouldnt know but yeah if you mean his music then we CO-SIGN! Glad you feelin skales too... and hmmm so I take it Keno doesnt do it 4 ya then? and I'm still tryna fix up bout your initial concern (when I wrote this in my head, it was short, tight and crisp but alas, I hope its still crisp though!!!). @ Leah... thanks for comin thru & blessing the blog. where you at the concert? heard he murked it! @ Janelle... You're likin Keno? Good stuff! Awww bless this young talent!! I can definitely see a comparison to a young Craig David when he first came out back in early 2000. Can't believe he only is 18, he is really doing his thing!! If he continues the way he is going, he is going to have a great future ahead of him. Big up Chipmunk on the mixed messages track!! skales is definitely tight.....not suprised one bit and from what i gather he is working on fixing that whole management issue. i see u r going very r n b this week....i am feeling young Nate,love the rhythm but he needs to actively work on creating his own niche so he doesnt end up in someone else's shadow!! since u r feeling r n b this week,you check out Naija'a Waje,Symun and Justina. i cant wait to hear what u have to say!! well done,good job!! ciao!! @ SapphireChic... Thank you for your blessing! You're too right bout Skales & I do hope he gets decent management though! Yeah Nate'll definitely smack the scene and cos he's still quite young, he'll have that younger market easssyyy but I do get you bout the 'somebody else's shadow' problem. Can you point me in the right direction for these acts, I have heard Waje but not the other two. & @ Anonymous... I see you're feelin Young Nate! He's dope as heck! And Chippy is the truth too!!! I know this brova though!!! He was @ Promo last bank holiday, wasn't he??? Yo bredrin who's this skales character though? His flow is quite the business but don't you think he sounds like a girl sometimes. Just my two pence family. @ Kayleigh... I dunno mehn lol! But from what you girls are saying, he must be then! y r u people not showing keno love? his sound is very mature & me oh, i like it! @ yemi... they just dont get it I think! I'm feelin 24/7, sorta stuff my woman and i can just relax to on this fine sunday evening. Erm Keno- i won't have him on my ipod ('nuff said) i'll prolly listen to him on the radio or summin y'dig.....that said the never stop song was not half bad and if that is the unfinished fing'....bring the finished version on eh! @ 'Demola... Thank you for those 2 cents! We love it lol! I dunno, I think Young Nate can pull it off... he's opening for the Lloyd/Marques Houston concert a couple weeks time, thats major movements you know. & Skales, well you said it fam, you said it! And that voice that you're talkin bout, we need to find him seriously lol! Well to be honest, not many people step up to trybesmen's 1999 album, NOT even eldee, KB & fr3 have reached that level since so that's a tall ask by any standard you get me. & Keno? I dunno why you guys aint feelin him, i reckon his style is quite nice, maybe a bit grown-up but still G.O.O.D.M.U.S.I.C! KenO's music is different and he knows it. He does not try to conform, he wants to be free with his music; creating good music that is universal. @ MolaOG... Thanks for peepin the blog! We do hope you return! You got Keno down to a tee right there. I think he makes that music that people can feel, no pigeon holes, no labels, jus music you get me. You should listen 2 Young but actually go one post up and listen 2 Symun, that dude is the truth! You guys are going to like this new group that I'm about to tell you about! Check 'em out! TRAVIS PORTER has an album coming out called "From Day 1" on the 29th of May, and you can now pre-order it on iTunes: http://bit.ly/K29XFf !